Mary Lee has been with Saint Paul Sunday since the first program when she poured coffee for the musicians in the now defunct "coffee corner." Her responsibilities have broadened since then, including managing the Classical Music Initiative, but SPS is still her radio first love. She is always happy to work on a recording session, even if it's just pouring coffee. Vaughn Ormseth first came to Saint Paul Sunday (then Saint Paul Sunday Morning) in 1992 and has in one way or another worked on nearly every aspect of the series, from artist selection to booking, writing, directing, editing, music producing -- and all those little in-between roles that make producers such obsessive people. He originally came to SPS as an arts writer and still continues to write and occasionally perform as a singer. When he's in the studio listening to guests play their hearts out, in person or on tape, he thinks he has the best job in the world. Suzanne Schaffer joined American Public Media in 2003. As the associate producer for Saint Paul Sunday, she researches the music of each program and responds to mail from listeners. Suzanne also works as an associate producer for two other national music series, the Minnesota Orchestra and the Saint Paul Chamber Orchestra broadcast concerts. 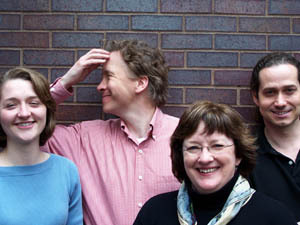 Preston Wright came to the Minnesota Public Radio family in 2002. He is Web Producer for for the American Public Media shows Saint Paul Sunday, Pipedreams, Composers Datebook, Saint Paul Chamber Orchestra, Minnesota Orchestra, and the Peabody Award-winning American Mavericks. He is also the arts and culture Web producer for regional Minnesota content.